For many, Enrique Peña Nieto represents much more than an opposition figure in Mexico’s current presidential election. Instead, he is the remnant of a corrupt regime known as the Institutional Revolutionary Party (PRI) that plagued the country for over 70 years. His ascendance to the presidency would be a step backwards for more than a decade of democratic progress in a nation that was dominated by the party’s authoritarian grasp. At least this is what several media outlets have been reporting. However, such analysis offers an inaccurate portrayal of the PRI’s history and role in contemporary Mexican politics. While the party certainly does not have a clean political record, the media’s unfair depiction of the PRI’s return to power misses some of the essential issues that the people of Mexico are facing. Take an opinion article published by the Los Angeles Times in May. 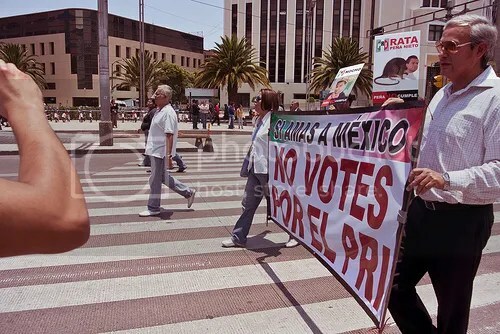 The author, a professor at the National Autonomous University of Mexico, argues that the PRI’s return would spell disaster for the country, as it would continue the near-century of corrupt practices that the party exhibited. Other outlets—including The Economist, the BBC, and Reuters—contribute to this rhetoric by presenting Peña Nieto’s presumed victory as a return of a solidified faction that dominated Mexican politics for generations. But to frame the party’s history as a homogenous continuity is highly problematic. Yes, Mexico experienced one party rule from the period 1929-2000; and yes, throughout the period, many of its members used unorthodox measures to stay in power. But with that being said, the party operated differently depending on the period in which it is examined. The one party system began as an attempt to institutionalize political conflicts that had previously resulted in violent turmoil. A quick glimpse into the history of nineteenth century Mexico will reveal a violent war for independence followed by a half-century of chaos, foreign occupation, and dictatorship. Political instability spilled-over into the beginning of the twentieth century as a revolt against Porfirio Díaz’s oppressive regime resulted in a 10-year revolution that left over 1 million people dead. The Post-Revolutionary state sought to put an end to Mexico’s violent past by condensing the country’s social unrest into a single party institution. The hope was that disputes between influential leaders would not have to take place on a grandiose social stage, but would rather be confined to debates within the party whose agenda would to preserve the values of the Constitution of 1917. The need for political coherency in the 1920s led to the creation of a party by the ruling elite that would eventually morph into the PRI. Initially, the schemed worked. The powerful figures that had ruled over specific regions of the countryside became entrenched within the system. Political violence eroded and Mexico became one of the most stable countries in the world during the twentieth century. Furthermore, it was one of the only Latin American countries to survive the Cold War without experiencing a military dictatorship. Among these accomplishments, the PRI has a convoluted political record. This is the party that nationalized oil in 1936, but also ratified the North American Free Trade Agreement in 1994. It defended labor disputes throughout the 1940s, only to smash similar movements in the 50s and 60s. The country experienced a generation of high growth rates under the PRI. It also went into economic depression during the 80s. Throughout this time, it is fair to argue that one constant feature of the one party system was corruption. But again, the extent that corrupt practices had on democratic institutions vary depending on what time period is being examined. As the country became more economically technocratic in the 50s, the relationship between business and government became uncomfortably close. While the party was enhancing its social institutions, many of its members were also curiously getting rich off of some of the policies. Things went from bad to worse during the next couple decades. The authoritative depiction of the party that many journalists offer stem from the 1988 presidential elections, in which the PRI blatantly rigged to come out ahead of the opposition. It should be noted that corruption did not vanish with the PRI, and is still a serious problem in Mexico to this day. These are just a few examples of how the historical foundations and decisions made under the PRI are more complex than contemporary historiography makes it out to be. Framing the current state of the PRI as a continuation of the old regime is very provocative and adds a twist to the election. However, Mexico is in a very different place than it was 12 years ago. The institutions that kept the PRI in power in the past have evaporated, and Peña Nieto will need to rely on winning the popular vote in order to win the election. If he were to succeed, he would be replacing Felipe Calderón and the National Action Party (PAN). Calderón’s presidency has left Mexicans demanding change due to the consequences of the policies enacted by his administration. The cornerstone of the Calderón presidency has been the war he launched on organized crime in 2006. Since then, 60,000 people have been killed due to drug-related violence. Furthermore, many of Calderón’s attempts to reduce poverty have failed, leaving more than half of Mexicans at, or below, the poverty line. While the country has succeeded in emerging from the global recession, it remains in fiscal deficit and has exhibited inconsistent growth patterns. Peña Nieto seeks to fill this void by taking a very centrist stance between the PAN, a traditionally conservative party, and the leftist Party of Democratic Revolution (PRD). His plans include liberalizing the energy sector to lower the cost of living while making reforms to raise wages in the service sector. To combat crime, Peña Nieto plans to add to federal forces and pass reforms to contribute to reduce the lure of drug trafficking. A few months ago, polls indicated Peña Nieto leading his contenders by double-digits. However, his uncomfortably close relationship with Mexico’s leading broadcasting network Televisa and a student-led movement against him have narrowed the gap between Peña Nieto and the PRD’s candidate Andrés Manuel López Obrador. But even with these shortcomings, it is very likely that the PRI will return to power after voters go to the polls in July. As international observers continue to commentate on the election, they should avoid spelling out doom and begin looking at the how shift in power will change Mexico’s current turbulent path.